Rose is a Professor of Psychology and Women's Studies at Cal State Long Beach. She also holds a License in Marriage, and Family Therapy, specializing in individual, family and couples counseling, and maintains a private practice in Long Beach, California. With over 20 years experience as an individual and couples counselor, she is currently serving as private practitioner working with a broad spectrum of clients. Among her areas of expertise include post-partum depression, relationship counseling issues, parenting issues, and working with those experiencing depression and anxiety. In addition to being a prominent relationship therapist, Dr. Rose Hanna has presented at National conferences and to general audiences speaking on the topics of marital success and parenting. In addition, she is a lecturer at California State University, Long Beach. She teaches in both the Psychology department and Women's, Gender and Sexuality Studies. 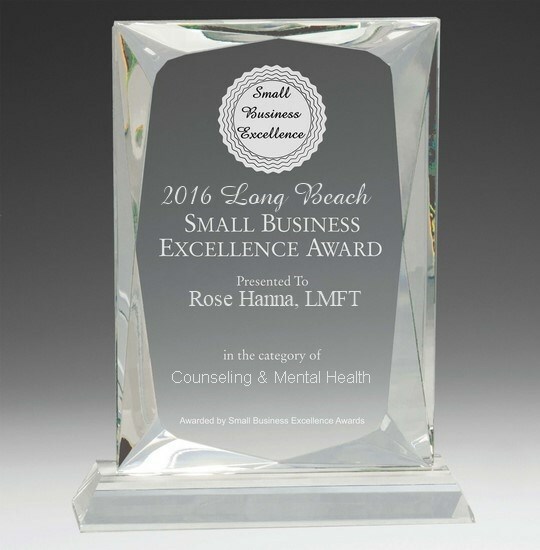 Dr. Rose Hanna is an interactive, insight-oriented individual and couples therapist. Her therapeutic approach is to provide support and practical feedback to help clients effectively address personal life challenges. She integrates complementary methodologies and techniques to offer a highly personalized approach tailored to each client. With compassion and understanding, she works with individuals to help them build on their strengths and attain the personal growth they are committed to accomplishing.